Wenn man sich direkt nach einem Messetag in den Zug wirft und wegfährt, dann behindert das das Beitragschreiben etwas… aber hier kommen auch noch meine wie immer sehr subjektiven und nicht vollständigen Eindrücke. This year I jumped directly from the trade fair into a train to go on a trip, so I didn’t have time to write about my findings. But now I have the time to sit down and will tell a bit about what I’ve found. Not complete and from my personal view only. Einige nette Aussteller haben auch dafür gesorgt, daß ich genug Sachen mitgenommen habe, um meinem Gedächtnis auf die Sprünge zu helfen. 🙂 Bei Organ gab es wenig überraschenderweise nichts neues, die Nadeln bleiben in bewährter Qualität. 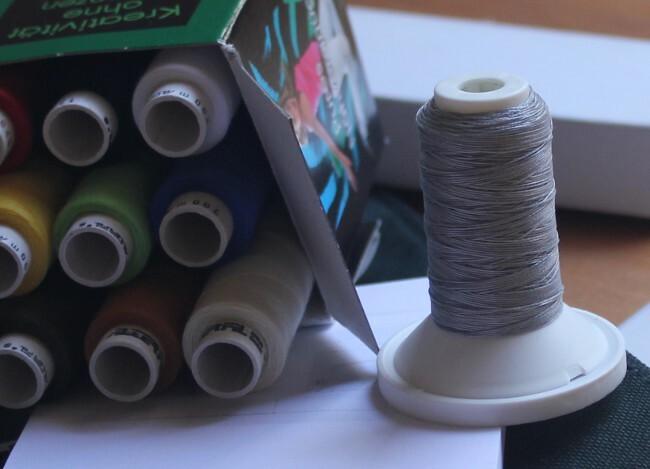 Aber Herr Ruppel hatte Zeit die Frage zu klären, was denn eigentlich die Topstitch von der Sticknadel unterscheidet… Die Position des Öhrs ist etwas unterschiedlich und die Topstitch hat eine etwas vertiefte Fadenrille (damit sie dickere Fäden auch gut aufnehmen kann). Wieder was dazu gelernt. 🙂 Ach ja, die Kolben der Nadeln sollen künftig ein Color Coding bekommen, damit man die Sorten auf einen Blick auseinander halten kann. Und die Frage „ist das jetzt eine Jersey Nadel, die noch in der Maschine steckt?“ der Vergangenheit angehört. Luckily some nice guys from nice companies had some gifts for me so I would remember better. 🙂 Nothing new at Organ needles, but Mr Ruppel had time for a question we recently couldn’t solve at the Hobbyschneiderin Forum. What is the difference between the topstitch and the embroidery needle? Yes, there is one. The position of the eye is a bit different and the topstich needel has a deeper „groove“ to accomodate thicker thread better. Oh, I nearly forgot… at least for Germany there are plans for a color coding of the needles so one can see quickly if the needle left in the machine is a stretch, a standard, an embroidery,.. or whatever needle. Und hier zum Vergleich noch mal ungeblitzt… neutrales grau. – Was ich dummerweise auf dem Messestand vergessen habe zu photographieren: Man kann den Faden auch beim Stricken mitlaufen lassen! Ein paar Reihen im Mützenaufschlag mitgefasst und die Sicherheit in der dunklen Jahreszeit erhöht. Der Effekt ist wirklich deutlich. Eine andere Neuigkeit lag leider auf dem Hotelzimmer….. elastischer Nähfaden um die Nähte bei elastischen Stoffen dehnbarer zu gestalten. Da soll ich aber was bekommen… ich bin gespannt, wie sich der vernäht. Sobald ich ihn habe, werde ich testen und berichten. Of course I did visit Mr Seitz and Mr. Amrhein from Alterfil. Even though I was not hunting prizes for a challenge or something, so I could just say hallo. And they had something new… if you did read my report from last years event you might remember that they had a reflective thread I loved a lot because it has a very strong an visible effect, but also looked plain grey and not glitzy at all when no light shone on it. If you look at the first picture you see a bright spot, that’s the thread under flashlight. The second pic is the same thread without flash, just by daylight. Well, the problem was that they only had it on big cones for around 70 EUR. And the good news is, that they found a way to wind it on smaller spools, so they can offer it to anyone who might not want to buy a very big amount. It’s not in the shop yet and Mr Seitz didn’t know the price right away, but it should be available soon and you can always ask per mail also if you are interested. What also was amazing (and I stupidly forgot to take a picture of…) was the reflective effect in knitwear. Yes, you can knit that thread also and adding it for some rows in the brim of a hat will give a super amount of extra security in the winter. 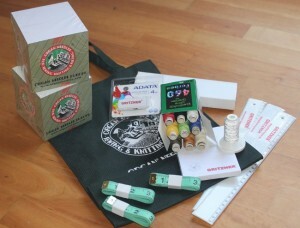 Not on the pic but brand new is a new sewing thread that is more elastic than the normal one. So seams in knit fabric will stretch better and break less. 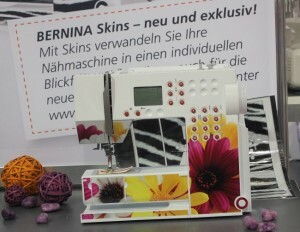 I haven’t seen it yet, but I am supposed to get a sample and I am very curious how it will behave on my sewing machine. As soon as I can test it I’ll tell you all about it. Für einen näheren Blick auf die Gritzner Nähmaschinen hat es dieses Jahr leider nicht gereicht, weil ich nur einen knappen Tag Zeit hatte. Ich hatte aber den Eindruck, daß die Anzahl der Modelle deutlich mehr geworden wäre. I didn’t have time to take a closer look on the Gritzner sewing machines because I only had one (not even complete) day. But I got the impression that they have more models now. 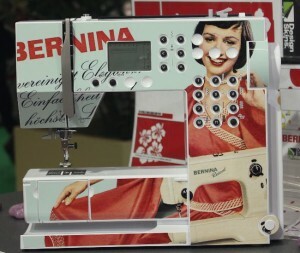 What cought my eye for the anusual design were the sewing machines from Alfa. (Forgot to take a picture, so this is from their website.) I had never heard of that company but they exist since teh 1920s…. in Spain. Like nearly all other companies they have the production in Asia (gossip says maybe Janome) but they came up with a new design. The idea is a simple sewing machine for young people who start to sew or want a sewing machine because they want to design or alter something occasionally. So the machines are simple meant to be easy to handle.The pic shoes the most simple version, there are some more. (Overview over the sewing machines.) Designed to please the generation i-pod, so they don’t have to hide it in a cabinet when friends visit. If you like the design is matter of taste, but they made left a good impression from what I could see. One would have to sew to say more, but I like the idea that the website contains video tutorials for all steps you need to start with that machine. From winding the bobbin to threading the machine. Wer es dagegen bunt mag und seine Nähmaschine gerne mal umzieht, der kann seiner Bernina jetzt eine neue Haut verpassen. 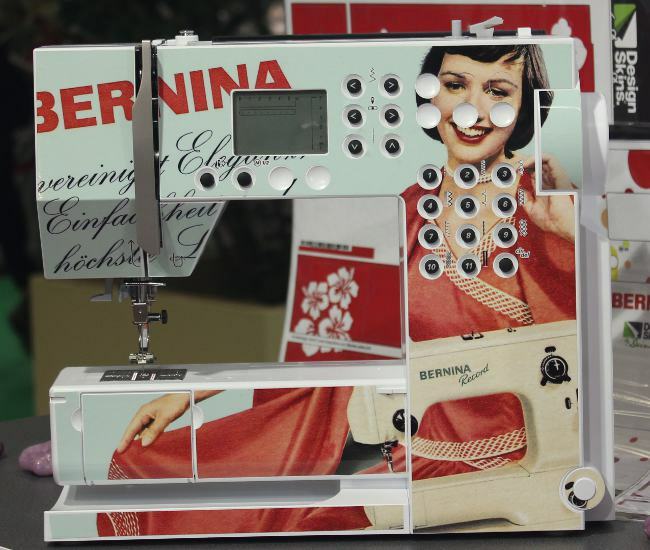 Macht Bernina nicht selber, sondern in Zusammenarbeit mit einem Partner, aber hier ist jeder Wunsch erfüllbar. Man läd sein eigenes Bild hoch und bekommt eine Folie, die man der Maschine nur noch aufkleben muß. Und wenn sie nicht mehr gefällt, dann zieht man sie wieder ab. 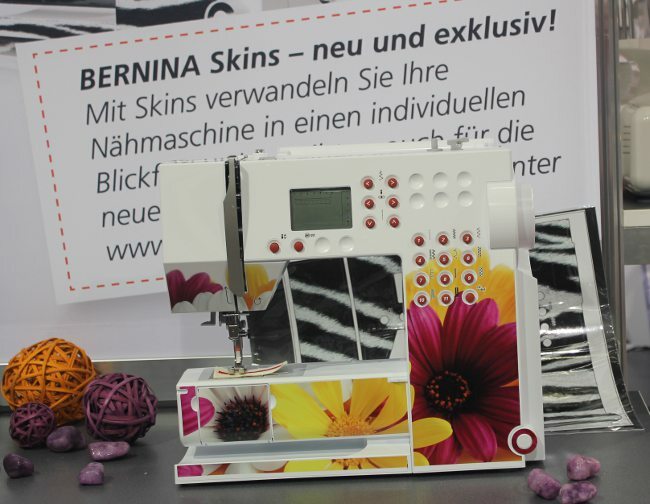 If you prefer more colorful designs and also like to change the look of your sweing machine, then you can get skins for your Bernina now. They don’t make those themselves, but with a partner, but you can upload any pic you want and then you get skins you can put on and pull off again once you don’t like them any longer. Wo ich diesmal nicht ungeschoren vorbei kam waren die „Impuls-Körbchen“ von Jim Knopf. Es gibt ja nicht viel, was man direkt zahlen und mitnehmen kann, diese Knöpfe mußten aber mit. Sehr nett wie immer war es auch beim Stand von Vlieseline. Meine Mustermappe kann ich jetzt mit einem Stück 244 ergänzen. Das ist ein ganz dünnes Volumenvlies, sehr weich und gar nicht steif. Das scheint mit eine gute Lösung für Übergangsjacken die man waschen will. 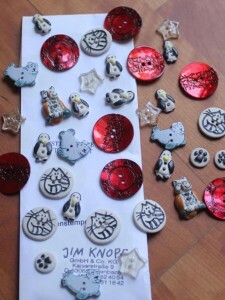 Form the Vlieseline (Vilene) booth I also picked something new. It has the number 244 and is a very thin „padding“. Really thin, very soft, not stiff at all. Seems good for jackets you want to wash in the machine. Dieser Eintrag wurde veröffentlicht in Messen, Nähen, Wolliges und verschlagwortet mit 2011, h&h, Nähen, Stricken von nowak. Permanenter Link zum Eintrag.